Marketing is a necessary task for any business. However, there are seemingly infinite ways to go about it given the current digital landscape. You might find yourself wondering, “how should I go about marketing my Advisory business? Referrals used to be the bread and butter marketing tool to spread the word about your financial service offerings. Do a good job for one client, they tell two friends or family members and boom, off to the races. Today that method, while still sometimes effective, can’t be leaned on as heavily as before due to the many factors and channels that consumers are using to make decisions in today’s digital world. So, what should you do? Plaster your name all over local benches? Take out ads in the paper? Make a commercial? Use one of the many digital marketing channels available at your disposal? How should you go about getting the word out about your business? In this article, I will discuss two contrasting methods of marketing that will get your name out there; who the audience for each is, how the message will get in front of the audience and how the audience will likely respond to each message, as well as how that affects your business. It’s a simple question that can confuse and confound those outside the marketing department. In reality, it simply refers to traditional marketing methods, such as broadcasting, print, direct mail and telemarketing. Everyone has been exposed to these methods, either through an ad on TV, fliers stuffed in your mailbox, or annoying phone calls while you’re eating dinner. Why do we call traditional marketing “Outbound”? The term was intended to mirror “Inbound Marketing”, which is the process of tailoring marketing efforts to attract qualified prospects to your business and giving them an experience that turns them into promoters of your brand. Major techniques in inbound marketing are content marketing, social media marketing and search engine optimization (SEO). The major difference between inbound and outbound marketing is that inbound marketing is generally targeted at consumers who are already interested or have an awareness, in some way or another. Outbound marketing is less targeted and casts its net on a wide group of people in an attempt to get them interested. “Outbound” marketing is sometimes referred to as “interruption” marketing because whatever people are doing (watching a TV show, reading the paper, watching the road while driving) is interrupted by the marketing message (commercial, a full-page ad in the paper, billboards). Inbound Marketing will continue to be effective in 2017 for a plethora of reasons; from the fact it can effectively target specific segments of the demographics, to the value it brings to potential customers pre-purchase, to the convenience and cost savings for the company. 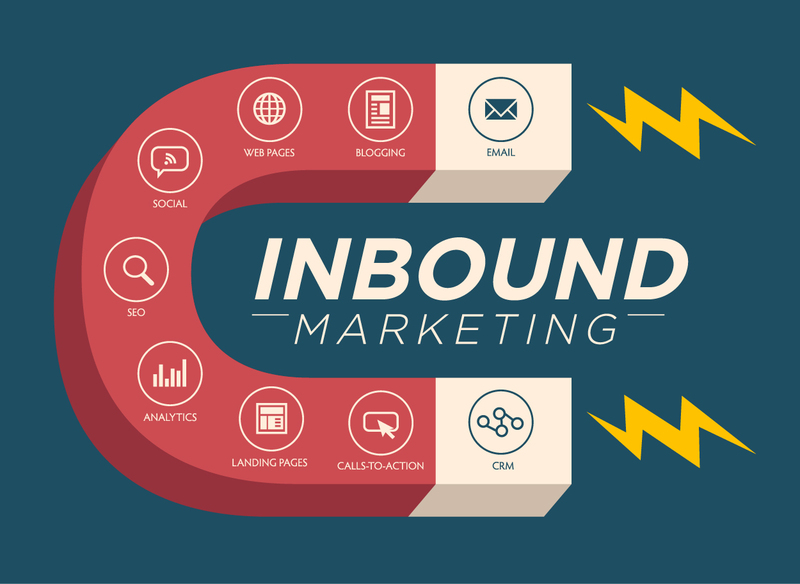 Inbound marketing costs 62% less than a traditional marketing campaign and generates 3 times the traffic of a traditional (outbound) marketing campaign. It makes sense though, writing a blog post or a few Tweets is far less expensive than purchasing ad space. A domain name costs only a small amount per year and the long-term costs associated with maintaining social media feeds, a blog, website or other assets that are common in inbound marketing are quite low compared with various forms of advertising. Even advertisements online (Google Adwords for example) would cost far less than TV ad time. The lower costs, and the agility of inbound marketing means that you may personalize the message to its target market to a near infinite extent. For example writing a blog post about how investing would work in the Harry Potter universe (to attract wizards and fans of wizardry), or what Batman’s portfolio would look like (to attract Gotham billionaire Bruce Wayne) at very little cost and in very little time compared to traditional forms of marketing. Inbound marketing allows hyper-targeting, tailoring your message to a specific audience in a way that will feel personal and convey that you can speak to and meet their specific needs and challenges. Convincing people to trust you with their assets is hard. No matter what medium you use. Selling your financial service to people online, and showing them that you can meet their needs and benefit them is even harder. While inbound marketing generally costs less than outbound marketing, the challenge of appearing to be a legitimate solution to someone’s problem can be much more difficult online. By sending a hyper-specific message to somebody who already recognizes that they have the need for a specific financial service, inbound marketing generally ensures that all marketing efforts are put in front of people who will actually consider your message, increasing your chances of attracting an MVP customer that can help grow your business. So why is outbound marketing dying? There are many reasons why outbound marketing is losing its lustre, from it’s interruptive nature to the slow, inflexible, and often costly process of creating an outbound campaign. A commercial break in the middle of your favorite TV show, an unexpected cold-call (which always seem to be at the most inconvenient time), spam mail with offers you aren’t interested in coming into your home and bringing clutter with it. People are growing tired of the interruptions and will do what is needed to avoid the interruptions. Over 200 million people worldwide use ad-blockers when browsing the internet, which renders banner, sidebar and pop-up ads ineffective for a large part of the target audience. The trend of blocking ads is not limited to browsing the internet. More and more people are using PVR’s or services like Netflix, Shomi or Hulu to avoid watching TV ads. Outbound marketing has annoyed people into avoiding as many ads as they can. Another issue with outbound marketing is the fact that these measures are often slow and inflexible. TV commercials, print ads in major publications, and billboards all take significant time to develop and arrange for them to be released to the public. This means that it is very difficult (and expensive) to have an ad that is current and based off what prospective clients want. Inbound marketing efforts such as Social media, content marketing and SEO are much more agile, meaning campaigns and marketing efforts can be real-time and relevant, with more flexibility and timeliness, all at a much lower cost. In addition to the difficulties mentioned above, there are issues in outbound marketing involving putting your message in front of the appropriate target at a reasonable price. There are still a few mediums with high viewership for a specific market segment (such as ESPN for sports fans) but many segments do not have such an outlet. This means that to market your product to your target market you must cast a wider net, perhaps by making a commercial and playing it during a show with massive viewership, hoping that some of your target market is watching. These efforts are very costly and generally return a very low ROI. If we were trying to attract clients to our financial advisory firm we could put an ad on the back cover of our local newspaper, potentially paying tens of thousands of dollars for that ad space. The issue is that although some targets may see the ad, it still got in front of many people who wanted nothing to do with it and are not at all interested. This can be a wasteful process. We could spend far less money designing a top notch website, paying for a domain name and using SEO to ensure that every single person who Googles “Financial Advisors in (Where you live)” will see our website, and our thought leadership content. Simply put, inbound marketing is far more effective at matching your value proposition to a target customer. Today, if people want something, they Google it, Bing it, or Yahoo search it. They understand there is a market for whatever they are looking for, from financial services to a new furnace. People today don’t want to be sold something. They want to buy it themselves. How does this affect you? That depends entirely on how you want your business to grow into the future. Are you satisfied with an aging client base, who will soon begin to retire, divest and live the easy life? Would you rather have a client base full of millennials just getting into the workforce, still needing to buy a house, plan for a family and work for many years to come? Generally speaking the older someone is the more likely they are to be influenced by outbound marketing. Younger generations want personalized, unobtrusive marketing efforts. For your practice to thrive and survive in the future you will need to meet the needs and expectations of those generations. 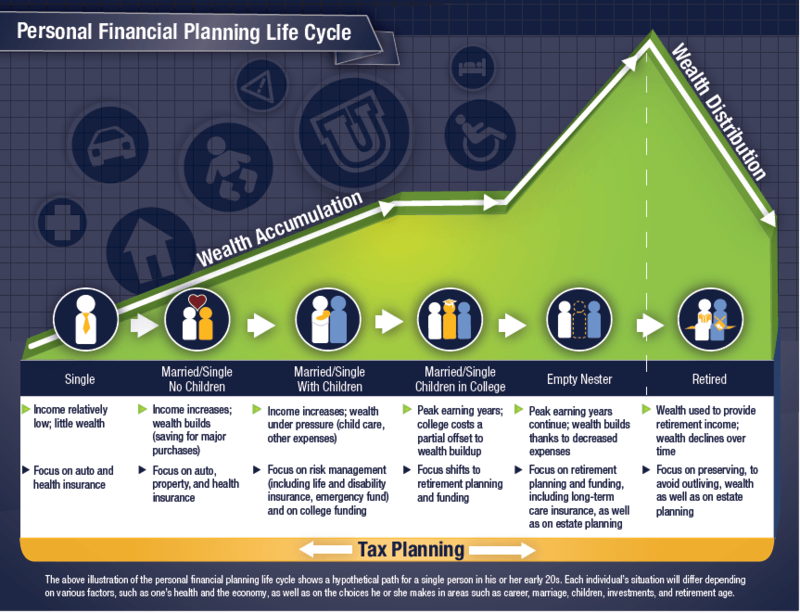 For your business to thrive you need clients who are still in the Wealth Accumulation stage of the Financial Planning Life Cycle (as shown above). At this time most Baby-Boomers are moving through the “Children in College” phase and into the “Empty Nester” phase. Roughly 10,000 baby boomers turn 65 every day and that will continue for the next 15 years. To maintain relevance in such a competitive industry, financial advisors must work twice as hard to cater to the future, even if that means moving away from word-of-mouth referrals that has been the gold standard for your entire career. It may mean moving towards having a strong digital presence that draws in targets who have already identified a need that you might be able to help with. Another reason to focus your marketing efforts on inbound tactics is that studies show 70% of internet users would prefer to learn about products via content instead of advertisements. Roughly half the world’s population uses the internet, with that figure even higher in developed nations. With the increase of internet users with adblock technology installed and the population steadily migrating away from traditional forms of media and towards digital media, nearly every industry is going to have to get serious about their content marketing, use of social media and their ability to personalize messages. For financial advisors and financial service providers, inbound marketing can be the next generations referral system. Instead of attracting one client and building through their network, establish your own network. Create engaging, informative content that can help solve consumer’s challenges and put it out into the world so those looking can find it, and more importantly find you. This means you need to create your own social network, create engaging content, teach people things about finance through creative, engaging, educational content. Have them come to see you as a thought leader and when it’s time for their purchase decision, it’s likely they will choose the most experienced, capable financial advisor in their social network, which thanks to your efforts educating and engaging them is YOU. Don’t be left behind in the new generation of digital marketing. Establish your name and build your social network. The only way to thrive in the future of of financial services is to show the world just how good you are – online!